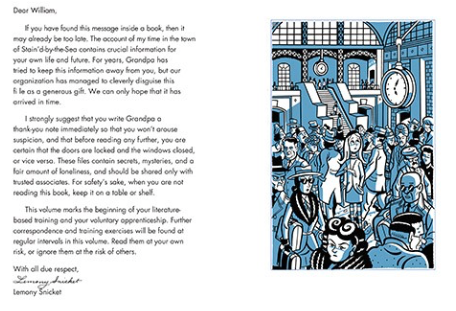 Lemony Snicket is looking for trusted associates! He's ready to reveal his account of the time he spent in a fading town full of mysteries, and share his secrets with associates-in-training. Do you know a curious reader? Get started on an intriguing journey. 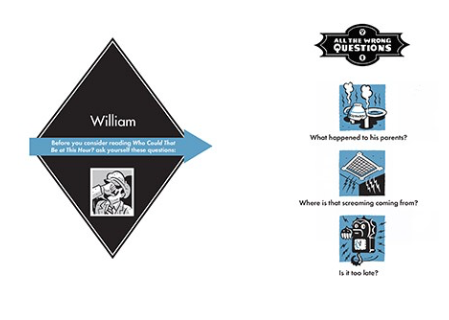 All the Wrong Questions is Lemony Snicket’s second series and follows the wildly successful A Series of Unfortunate Events, which has sold over 65 million copies worldwide and has been translated into more than 40 languages. All the Wrong Questions has reunited Snicket with his longtime representative, Daniel Handler, author of the Printz Honor–winning young adult book, Why We Broke Up, which was described as “beautifully rendered” by the New York Times and “perfectly pitched to woo romantics of any age” by the San Francisco Chronicle. Handler is also the author of We Are Pirates, The Basic Eight, and Adverbs. Acclaimed illustrator Seth returned (against his better judgment) to illustrate the cover and interior art. The cover of “Who Could That Be at This Hour?” was named one of the New York Times’ and Flavorwire’s favorite covers of 2012. Seth is also the creator of Palookaville, Clyde Fans, and The Great Northern Brotherhood of Canadian Cartoonists. 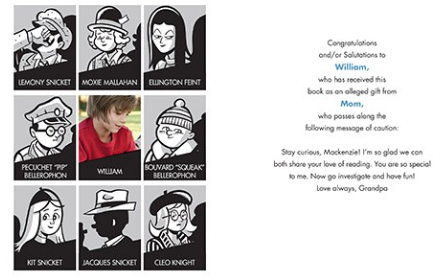 Put Me In The Story creates personalized versions of bestselling books featuring your favorite characters. With your name, picture, dedication message, and more, YOU—our readers—have become our most dynamic characters. Put Me In The Story inspires a love for reading, across all ages and generations, through the experience of shared, personalized stories. Become the star of a great adventure at www.PutMeInTheStory.com. I would like to thank Little Brown and Put Me in the Story for providing me personalized copies of this series for review. These books are too cool! 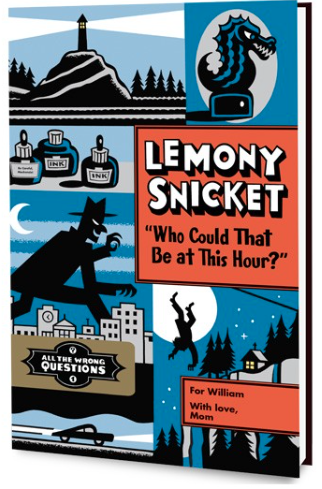 For those who enjoyed A Series of Unfortunate Events, Lemony Snicket has set a new pace for his readership. 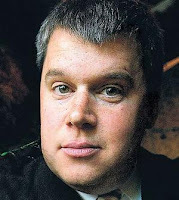 In this introduction to the All The Wrong Questions series, we meet Lemony Snicket before he became the author of the ASOUE series. Yes, that's right. This is a prequel! 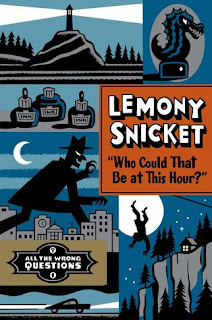 Lemony began with an apprenticeship in a secret organization dedicated to solving mysteries. In "Who Could That Be at This Hour?" we travel to the land of Stain'd-by-the-Sea where a special object has supposedly been mysteriously stolen. But has it? Although this series (so far) doesn't quite reach up to par with A Series of Unfortunate events, it definitely has its own charm. I love that Lemony is matched up with the 52nd ranked chaperone out of 52, thus causing moments where Lemony is more aware of what is going on than the person training him, S. Theodora Markson. I thought it was clever how the "S" in Theodora's name is a mystery, and whenever asked about it she responds with alliteration of the same. The tone is reminiscent of previous Snicket books. I read half the book in text and then finished it on audio, and I enjoyed both. Regardless of whether the story meets preconceived standards, I think the personalization makes them worth it. Imagine your 10 year old self receiving a book by one of your favorite authors with your name and photo in it. This goes beyond just sticking a name in a book; it's executed in such a way that the receiver truly feels like the book was made for them. I haven't seen this done in this detailed of fashion before, and I am very impressed. These make great gifts for any little adventurer!